Elongation stands for a mechanical property of metal i.e. the degree to which a material is supposed to be delivered, stretched, or compressed prior to rupture. It is a point among tensile strength and yield strength and is presented as a percentage of the original length. 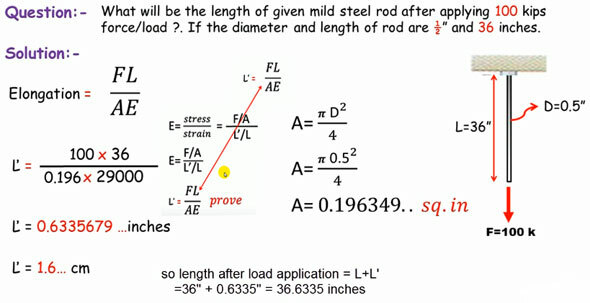 Problem: Find out the length of a mild steel rod after providing 100 kips force/load. Suppose the diameter and length of rod are ½” and 36 inches.